My daughter turned seven in the spring and to celebrate I threw her a baking party with friends. This sweet girl is my helper in the kitchen and she is always in the mood for baking up a treat. A baking party seemed like just the right theme for her birthday and when I mentioned the idea to her she instantly fell in love. She also loves planning parties so I let her take the lead. She decided she wanted the decorations to be in pinks and blues. My daughter loves to draw too so I thought it would be fun for some of the party decorations to display that. I had her create and decorate this banner for that reason. She had a lot of fun making it. Each party guest got to decorate five cupcakes. Four to take home and one to eat at the party. There was frosting of all colors with different decorating tips, icing, sprinkles, candy, chocolate chips, and sugar paper to decorate the cupcakes with. I did a little demonstration to give the kids a some ideas of what they could do and then they were free to use their creativity. They loved it! Each little baker got an apron to wear at the party and bring home. It was a good thing too because things got a bit messy. I found these aprons at Chefskin. Their children's aprons are only $2 each! What a deal, huh? They also sell chef's hats and other things. After cake decorating we played a few games which my daughter helped come up with. We first played a get to know you game since all the kids didn't know each other. Whoever was tossed the cupcake bean bag and said, "My name is ___________ and my favorite treat is ___________. After that we played hot potato. For this game I made a potato out of fleece and filled it with rice. To make it hot I placed it in the microwave for 30 seconds and it was ready to go. I played candy themed songs while the kids passed the hot potato. When the music stopped or if they dropped the hot potato then they were out. I'm sure you all know how to play . . .
Then it was pin the candle on the cupcake. My daughter had fun decorating the cupcake poster and candles to help get ready for the party. Another game was this cookie cutter matching game (inspired by ikatbag). The kid were divided into two teams and they raced to see who could match up all the cookie cutters onto the poster first. We also played a chopstick game. I had my husband show the kids how to use chopsticks (because I sure can't). The goal of the game was to get the noodles from one bowl into the other using their chopsticks. They didn't have to use the chopsticks the right way of course. It was fun. After games it was time for cake and ice cream. Everyone got to decorate an ice cream sunday to eat with their cupcake they had decorated earlier. Each guest got to take home a goody bag, a treat box with their decorated cupcakes, and their apron. The goody bags were simple. Sugar cookie mix, cookie cutters and a rolling pin. It was a very fun day. Everyone had a great time. My daughter declared it the best birthday party ever. I'm so glad she thought so! Darling! I love the fun games you came up with. It makes me wish I could have been there! What a cute party theme! Thanks for sharing! Ouahou it was just incredible! Can i be your daughter?? 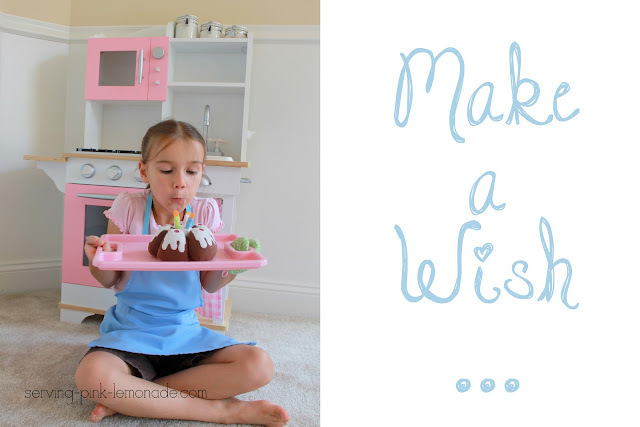 Absolutely love this idea and will be passing it along to my niece for her daughter's next birthday party! I will also be pinning this. Love it! What a fun idea, it turned out so cute! What a lucky little girl...she will have all those great photos to help remember her special day. What a cute idea, and so original! It looks so simple and yet so much fun! So much fun! It looks like she had a wonderful time. ;) Thank you for sharing at our Simply Create Link Party! A lovely idea for a party theme and it sounds like everyone had fun. Adorable, and fabulous ideas! thanks so much for sharing on craft schooling sunday! I'm amazed! My daughter would LOVE this.